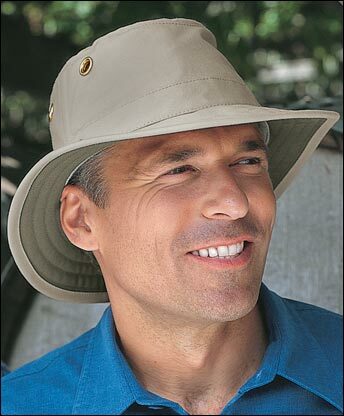 Wide down-sloping brim for those who prefer ample sun protection and shelter from rain. Great hiking and Kayaking hat for any weather! Material: Cotton Duck. -Won't Shrink! Not perfectly but usually quite adequately. Happily, the brims of the cotton-duck Tilleys actually become stiffer when they get wet, not floppier, helping to protect your neck, face and glasses. The Tilley comes with a tuck-away, adjustable, fore `n` aft Wind Cord. When it`s calm, the Wind Cord stays hidden in the crown. When there`s a breeze, place the cord with the sliding knots behind your head. When it`s really windy, use the chin cord too. 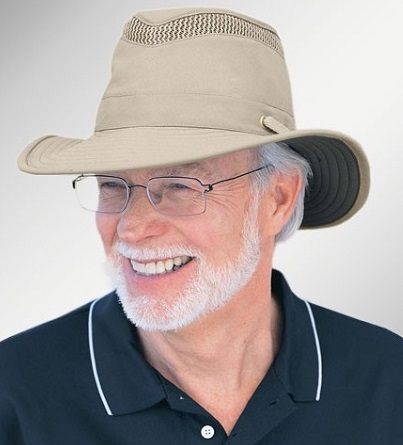 The fabric and style of all Tilley Hats have been certified to block 98 percent of harmful UVA and UVB radiation and deliver an ultraviolet factor (UPF) of 50+, the maximum rating given. A layer of closed-cell foam in the crown provides the Tilley`s positive buoyancy. This is a boon to paddlers and fishermen! Your Hat is guaranteed for life (yours, mine or its) not to wear out or fall apart. We're delighted to think that yours may be passed on to the next generation! The cotton-duck Tilley T4 was designed especially with canoeists and kayakers in mind. It has also made a hit with gardeners and with others who need the ample sun and rain protection provided by the down-sloping brim. Broad down-sloping brim with 3/4" ventilation mesh . Super light and breathable! Material: Nylamonite. -Won't Shrink! the Lighterweight LTM6 Tilleys are excellent at repelling rain. The Tilley comes with a tuckaway, adjustable, fore `n` aft Wind Cord. When it`s calm, the Wind Cord stays hidden in the crown. When there`s a breeze, place the part with the sliding knots behind your head. When it`s windy or you`re sailing, use the chin part too. Use a tape measure to measure your head just above your ears and eyebrows. Is your measurement in-between? Order the next larger size.